The Solar Power Satellite (SPS) concept would place solar power plants in orbit above Earth, where they would convert sunlight to electricity and beam the power to ground-based receiving stations. The ground-based stations would be connected to today's regular electrical power lines that run to our homes, offices and factories here on Earth. Why put solar power plants in space? The sun shines 24 hours a day in space, as if it were always noontime at the equator with no clouds and no atmosphere. Unlike solar power on the ground, the economy isn't vulnerable to cloudy days, and extra generating capacity and storage aren't needed for our nighttime needs. There is no variation of power supply during the course of the day and night, or from season to season. The latter problems have plagued ground based solar power concepts, but the SPS suffers none of the traditional limitations of ground-based solar power. The satellites would be placed in so-called "geostationary" or "Earth synchronous" orbit, a 24-hour orbit which is thus synchronized with Earth's rotation, so that satellites placed there will stay stationary overhead from each's receiving antenna. (Likewise, today's communications satellites are put into geostationary orbit, and each TV satellite dish on the ground is pointed towards one satellite "stationary" in orbit.) 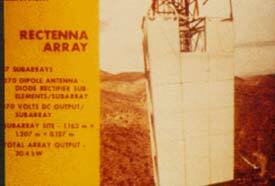 The receiving antenna is called a "rectenna" (pronounced "rektenna"). Geostationary orbit is very high, 36,000 km (22,500 miles) above the surface of the Earth. It is far above the range of the Space Shuttle, which has a maximum range of about 1000 km (600 miles) above Earth's surface. Aerospace company artists under contract to NASA and the US Dept. of Energy depicted the concept in the pictures at the beginning of this chapter. A technical depiction is given below. The SPS will consist of a large sheet of solar cells mounted on a frame of steel-reinforced lunarcrete or astercrete. The solar cells produce electricity from sunlight with no moving parts. The only moving part on the satellite is the transmitter antenna(s) which slowly tracks the ground-based rectenna(s) while the solar cell array keeps facing the sun. Each transmitter antenna is connected to the solar cell array by two rotary joints with sliprings. The transmitter on the SPS is an array of radio tubes (klystrons), waveguides, and heat radiators. They convert the electricity from the SPS solar cell power plant into a radio or microwave beam. The ground-based rectenna consists of an array of antennas and standard electronics to convert the energy into regular AC electricity which can then be supplied into today's power lines. The above pictured SPS is the basic concept defined by the U.S. Department of Energy and NASA "Concept Evaluation and Development Program (CDEP)� studies. An alternative concept, replacing the solar cell array with mirrors to heat a thermal engine to generate electricity, was called the "PowerSat". The word PowerSat seems smoother than the phrase Solar Power Satellite and especially its acronym SPS, and "PowerSat" is commonly used for both kinds of satellite, but sometimes there is confusion in esoteric professional circles because "PowerSat" was initially used for the alternative, thermal generation satellite. Hopefully, the generic sounding word "PowerSat" will start being used to denote either, as people could say "thermal PowerSat" to denote the thermal generator type. The thermal PowerSat shared the same transmitting antenna and rectenna as the solar cell PowerSat. 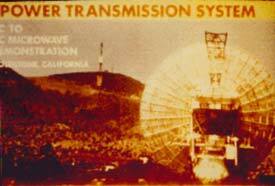 The following photos show the testing of the SPS phased array transmitter-beam system, which took place across the California desert, the receiver a kilometer away from the transmitter. Rectennas would probably be located above crops and livestock. A wire mesh screen can be placed between the rectenna and the ground which will cut out practically all the beam that leaks through the rectenna but will be over 80% transparent to light. In northern climates, adding glass to these structures and perhaps fluorescent lights could create greenhouses for a small additional cost (i.e., mechanized agriculture). Some designs have them floating offshore or on lakes, e.g., in Japan. (Having passed through Tokyo Narita airport, which is on a manmade island, I don't underestimate the economic viability of this concept.) They could double as fish farms for a relatively small add-on cost. The SPS is not eclipsed by the Earth but is in sunlight continuously, 24 hours a day, due to its high orbit. The only exceptions are several days around the seasonal equinoxes, March 21 and September 22, when the satellite will be eclipsed briefly around midnite, for up to an hour and 12 minutes. Notably, electricity will be needed for all sectors of space development, and thus the SPS can initially be used for in-space power in the early years of space development, with power being beamed to Earth after space-based industry grows. Thus, the SPS fits into a practical scale-up scenario. It may first be located at the site of major factories. Adding a transmitter will allow it to off-peak power to other sites, i.e., sell excess power -- to facilities in nearby orbit, or the lunar surface, or to Earth economies. Electric powered orbit transfer vehicles could also use beamed power, replacing a heavy solar cell array with a lightweight rectenna to increase vehicle performance and reduce damages by transporting a solar cell array through the Van Allen radiation belt. The solar power satellite fits into an asteroidal and lunar materials utilization scenario very well -- it is composed of materials most abundant in asteroids near Earth and/or from the Moon, and it is made up of a small variety of simple parts mass produced in large quantity. The industry required in space to produce SPS components is relatively modest. Some design studies claim that more than 99% of an SPS can be made from asteroidal and/or lunar material. The silicon solar cells can be made from lunar or asteroidal silicon, as silicon is the second most abundant element on the Moon and likewise in many kinds of asteroids. Purification of silicon is easier in the vacuum of space, and better crystals grow in zero gravity (due to no convection currents). The glass cover over the solar cells could be silica glass (silicon dioxide) -- composed of the two most abundant elements on the Moon and likewise in many kinds of asteroids. The SPS structure could be made from asteroidal nickel-iron steel or steel-reinforced lunarcrete or astercrete using cheap glass-ceramics or fiberglass composites. The waveguides could be made of glass ceramics. The vacuum tubes to generate the beam could be largely steel in terms of weight, with the small electrodes perhaps imported from Earth depending on the level of effort we put into processing the different kinds of asteroidal materials. Given the advantages of manufacturing semiconductors in orbit, Silicon Valley could lose big business to competition from Silicon Orbit in the future. Computer chips are small and lightweight enough to bring back to Earth. A future generation of space-made chips may start to bring a close to many kinds of chip manufacturing on Earth, to the benefit of consumers and Earth's environment. The first to go into business making silicon solar cells in space may well become the first to dominate that business. That may be judged by the first to experiment in orbit and get patents.